ok, the scarf wins. hands down. I loved this stage - at 12 Nose doesn't do it much now. She is however, putting "Outfits" together that make her look like a freshman in college - so cool! What a fashionista! I love all the mix of colors. My daughter is fond of the Ellis Island scarf look as well. What fantastic pairing skills she has! 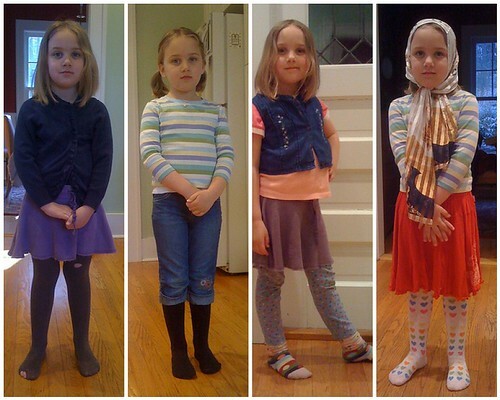 Last week my daughter went to school wearing both a dress and a skirt, together. She'll have a stage of hating the photos (I still recall my girls whining about their haircuts, circa age 8 or so, when they were in their teens. But .. I now cherish every shot my mother took, every memory of stuff she made for me to wear. If there were a fire, I would go back in for the album. (I now have them scanned and backed up, but the originals have sentimental value). She has a wide streak of fashion savvy, for sure. Tights with holes? Get some of those little patch thingies and darn them on. You can get butterflies, cartoons, logos, etc. Try any fabric or quilting store. My kids sewed these on their tights themselves. But she's so clever and talented! I love it. The girl has spirit! I love the idea of tights with capri over them. She is adorable. I love all the outfits. Nice array! 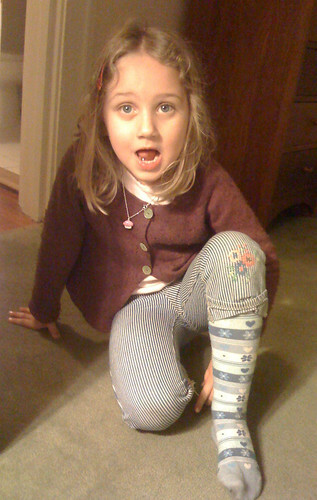 It makes me wish I had taken a picture of Ada yesterday, wearing a dress from M with non-matching pants underneath. And the ubiquitous rainboots. These are awesome! I love, love, love, truly, the black dress, orange tight, red shoe combo. It's genius. I may have to copy it. i love that you let her dress herself. wonderful! This is awesome! She and my Lola would be best friends, obviously. I love it! But I tell you, my girl could give your girl a run for her fashion money! You've got one like my 9 year old. JR can make ANYTHING look stylish. I'm speechless. The kid's got more style than I could ever hope for! she is so stinkin fabulous. Love the scarf. It really adds something. The girl has flair. She will so not hate you. Those are wonderful outfits. I wish I had her fashion sense. 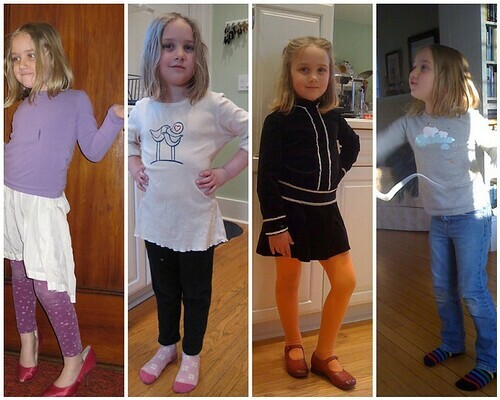 I predict that she'll be the editor of Vogue. Anna wintour...watch out. When she's about 12, maybe she'll hate these, but someday again, and forever after, she'll love them. She's definately got the look! Both in clothes and in a pair of soulful eyes. Beautiful little girl. She is really beyond cute. #4 looks like something from the movie "Yentl". LOVE this kid's originality. And I love that you encourage it.